Randy Ayers Nascar Modeling Forums :: View topic - I Finally Finished Something. Posted: Mon Dec 24, 2018 11:48 am Post subject: I Finally Finished Something. Believe it or not, this model took a little over 40 years to complete. 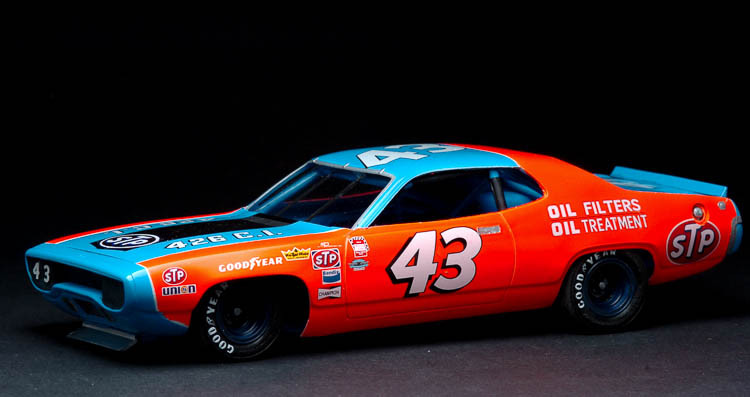 I had originally purchased the MPC '72 Plymouth kit in 1972 when it was first on the market. As many of you may remember, the kit had that horrible, generic, one size fits all chassis that wasn't really correct for anything. So the model didn't get built. Later on when AMT's eighties era NASCAR kits arrived I tried to adapt the chassis from one of them to this body. Also not really a good solution as the later truck arm style chassis was impractical to convert back to leaf springs and torsion bars. Again, I gave up on this project. About a month ago I was fooling around with the Polar Lights Richard Petty Charger issued just a year or two ago. It was then I remembered the '72 Plymouth body. And guess what? The two fit together almost perfectly. I did have to fudge the suspension around a little to get the tires up inside the narrower body but this combination worked amazingly well. And since I don't really have a decent 426 wedge engine this is a sort of curbside with the hood glued shut. I also did not include the iconic "peace symbol" head rest because after three failed attempts at making it from scratch, I gave up. Paint is Testors Model Master Fluorescent Red. The color does look a little off due to the inability of the fluorescent red to "register" correctly in photographs. The blue is sign Painters One Shot "Process Blue", a paint that is used by, well, sign painters and pin stripers. Decals are by Slixx. I replaced the kit "glass" with .005" clear styrene from Evergreen. And that's about it. As usual, comments, critique, and criticism are encouraged and welcome. Looks great! And if you painted the tire lettering on the MPCs - even better! That's a fantastic story, and even a more fantastic build. I'd say it was well worth the wait. Your build has my long time Fred Lorenzen 65 Galaxie 500 beat by over twenty years! I don't feel like such a procrastinator now! Your build is gorgeous!! The build looks good, your photography has a very “ back alley” lighting look. At least to my eye. Looks very nice and a great job persevering! Absolutely stunning and crazy that you post these pictures when you did! I just got three Petty Road Runners from GuyR1 in the mail today (I'm very happy with what I got and the price he gave it to me for by the way) have them spread out on the table in front of me, along with the one that I had already for 7 years. Yes the poor lights chassis does fit, so does the nobeano Oldsmobile. But builds of this quality deserve chassis that match. To my knowledge, no resin caster has ever put out an accurate chassis to eliminate days and weeks of Kit bashing and Fabrication. 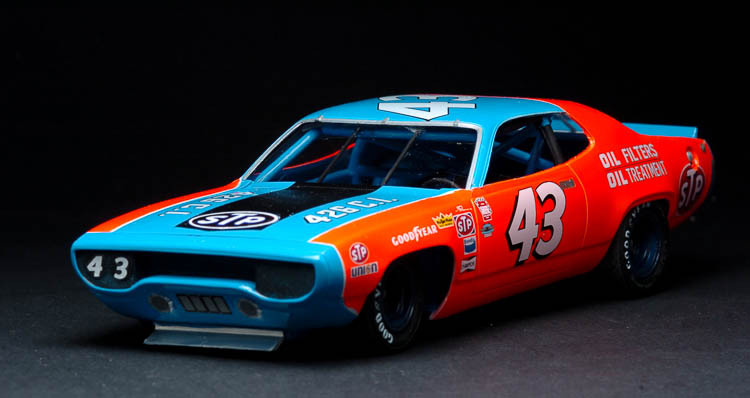 An accurate chassis for Mopar GN cars? Is this something that you guys on here would like? I know I would and I know I could come up with something and I also know at least two resin casters that will be willing pop a few out. What do you say guys? One last thing, my new friend Kevin at Missing Link resins has both a correct Hood and Hemi box intakes for this car. My favorite Petty car !